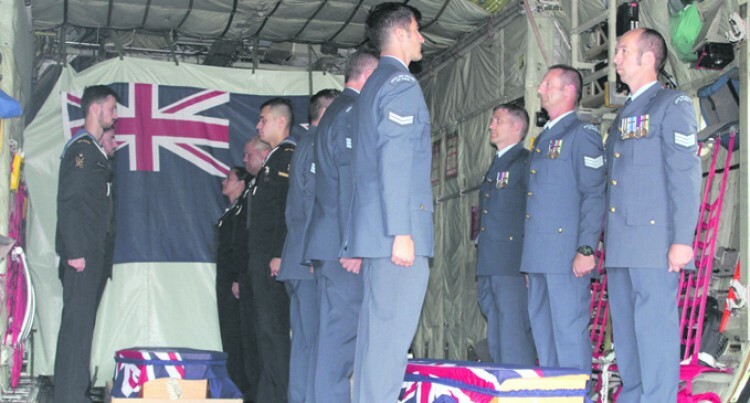 In military tradition the Republic of Fiji Military Forces yesterday handed over the remains of two military personnel Flight Lieutenant George Beban and Leading Aircraftman Ralph Scott, who died in Fiji decades ago, to the New Zealand Defence Force. In accepting the remains on behalf of the NZDF, Lieutenant-Colonel Charmaine Tate said they were thankful to the Fijian Government for letting the remains go home. “I must thank the Fijian Government for letting the remains go home to their families,” she said. She said NZ extended a heartfelt acknowledgement to its brothers and sisters of Fiji for the continued care for its servicemen who remained in the heart of Fiji. 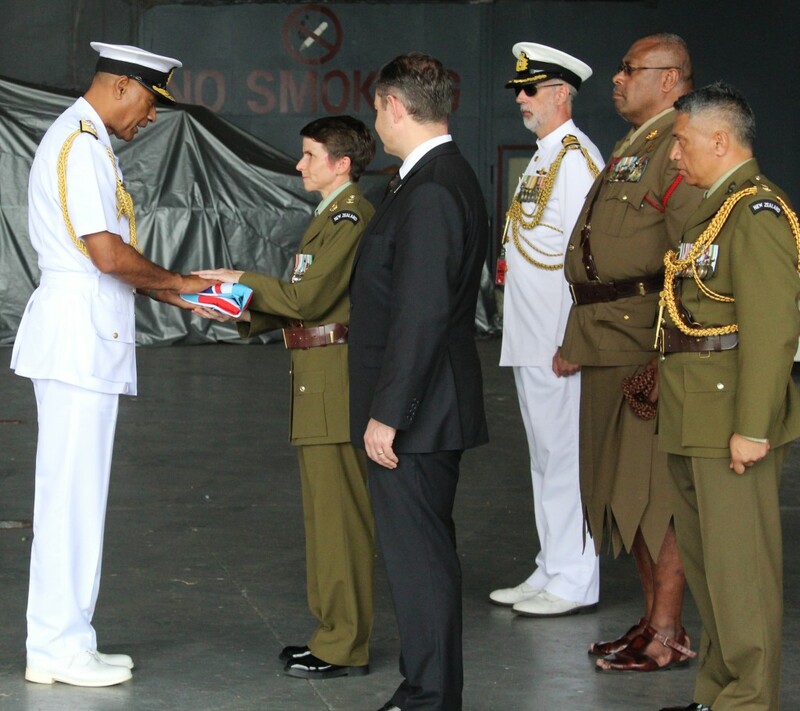 The ceremony started with the RFMF bearer party carrying the two coffins into the hangar accompanied by music provided by the RFMF Band and placed them in two prepared stands on top of mats. Major Meli Bulitiliva on behalf of the RFMF Commander Rear Admiral Viliame Naupoto traditionally handed over the remains and these was accepted by Lt-Col Tate. He said it was an honour for Fiji to have the two airmen buried at the Suva Military Cemetery in Lovonilase, Suva. The two airmen died of natural causes in 1956 and 1960 while at the RNZAF’s then Laucala Bay base in Suva. Both coffins, before the handing over, were covered with Fiji flags. The Fiji Navy officers carrying the casket of the late Leading Aircraftman Ralph Scott and the Royal Fiji Military Force carrying the casket of the late Flight Lieutenant George Beban during the farewell at the Nausori Airport on May 7,2018.Photo:Simione Haravanua. After the traditional handing over ceremony the last post was played by RFMF Band bugler Corporal Simione Togoloa. Following this the Fiji flags were removed and handed over to Rear Admiral Naupoto, who later handed them over to Lt Col Tate. The two coffins were then covered with NZ flags by the NZ Air Force bearer party and were taken to the NZDF C-130 Hercules which had arrived from American Samoa with the remains of navy mechanic Russell Moore. He died in an accident on a survey vessel there in 1956. When the two coffins were taken to the C-130 Hercules, the RFMF guard of honour presented arms and the RFMF Band played Fiji’s farewell song `Isa Lei’. Republic of Fiji Military Forces Commander Rear Admiral Viliame Naupoto presenting the Fijian flag to LT Col Tate during the farewell on May 7,2018. Photo:Simione Haravanua. Lt-Col Tate said the farewell was very emotional and she thanked the RFMF Commander for the touching event. She said there would also be a similar ceremony awaiting the remains at Ohakea Airbase. Meanwhile, a report published by the New Zealand Herald said the repatriation of the men’s remains was the result of a policy change announced last year to bring home service personnel buried overseas between 1955 and 1971. It adds that the repatriation, part of project Te Auraki (The Return), is among the 37 servicemen and dependants expected to be repatriated over the next six months.